Montpelier in Bristol, England, reflects architectural styles over time. Montpelier Conservation Group strives for this to continue with good design of 21st Century buildings alongside sympathetic refurbishments of existing ones. Montpelier Conservation Group is concerned primarily with issues relating to the built environment of Montpelier and its neighbouring areas. Much of our time is taken with considering planning applications for buildings and attending related meetings. But we have also worked on bringing Montpelier Park to life, on improving road layouts and street furniture, and setting up the MontpelierPages online directory. Minutes of our meetings are available to download from the MCG Minutes page. MontpelierPages is a local directory of services in Montpelier. Know Your Place enables you to explore Montpelier through historic maps, images and linked information. For planning matters see Bristol City Council planning and building regulations. Here you will also find a link to the Montpelier Character Appraisal which was adopted in 2009. Other information Bristol-wide is available on the Bristol Civic Society website. Test your Montpelier knowledge here, complete with the answers! Why not come along to the next MCG meeting? Montpelier Conservation Group usually meets once a month. 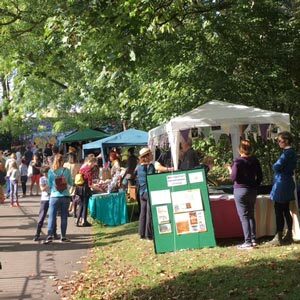 This was the MCG stand at the 2017 Montpelier Bean Feast in Montpelier Park. We were selling copies of the book Montpelier - a Bristol suburb by Mary Wright for £10. If you would like to buy a copy, get in touch via the contact link above. No need to wait for the next Bean Feast! Carriageworks Action Group and Montpelier Conservation Group were awarded funding in 2014 from the Heritage Lottery Fund to explore memories of Westmorland House. The project details are here. If you have memories of living in Montpelier many years ago, we would be interested to hear them. Montpelier before the War (70KB pdf). Looking for Paradise Cottage (9MB pdf).